Ireland is generally a very safe place as regards wildlife. There are no longer any large predators that might be considered a threat to humans e.g. no bears, no wolves, no large cats. However, as a result of our mild and humid climate, Ireland is home to some of the smaller creatures that may prove troublesome. In Wild Nephin Ballycroy National Park two such creatures include the biting midge and tick. Visitors may encounter swarms of midges (small biting flies) on warm and humid days. Walkers venturing off tracks may be bitten by ticks. All walkers should be aware that ticks can, in rare cases, carry Lyme Disease. Midges are tiny biting flies measuring approximately 1mm with a wingspan of less than 3mm. They are most active during early mornings and evenings between May and September, on cloudy days when it is calm, moist and overcast. They don’t like strong sunlight, dry air or wind. They can also be an annoyance in the lower lying areas particularly sheltered areas with trees and shrubs. Midges are usually found close to still water, as their larvae are aquatic. Stagnant water provides a place for the larvae to feed and develop. Bogs, one of the dominant habitats in Wild Nephin Ballycroy National Park, are therefore an excellent habitat for midges to proliferate. Female midges require a blood meal (protein) for their eggs to mature. Attracted to carbon dioxide, a gas exhaled by mammals, means that humans standing still on a calm and cloudy day are a target for midges. Insect repellents are widely available in pharmacies and supermarkets, which help deter midges. However, the best strategy to avoid bites is to cover up and wear full arm and leg cover and a hat. Light colours should be selected as midges are attracted to dark colours. Midges can be kept off the head and face by using a specially designed head net (note dark nets are best for seeing through). Ticks are parasites that bite. They are tiny, spider like animals that that feed on the blood of mammals (including humans) and birds. They attach to the skin of the animal for up to a week, growing in size as they feed. 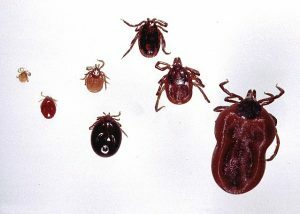 Ticks are more numerous and more active in the summer months. Anyone visiting Wild Nephin Ballycroy National Park should check for ticks, especially in the summer and autumn months. Parents should check any small children on their return home. Lyme disease is a bacterial infection that is spread to human by infected ticks. Lyme disease (also known as Lyme borelliosis) is an infection caused by a spiral-shaped bacterium called Borrelia burgdorferi that is transmitted to humans by bites from ticks infected with the bacteria. The symptoms of early-stage Lyme disease develop between 3-30 days after being bitten by an infected tick. The most common symptom of early-stage Lyme disease is the appearance of a distinctive skin rash that is known as erythema migrans. Erythema migrans looks like a bull’s eye and develops at the site of the tick bite. The skin affected by the rash will look red and feel slightly raised to the touch. The size of the rash can range from between 2-30 cm (0.7-12 inches). The best way to prevent Lyme Disease is avoiding tick bites. You can do this by taking the following precautions. Walk in the middle of paths/trails; avoid overgrown vegetation, sitting on logs and leaning against trees. Wear a hat and tuck in hair. Wear a long sleeved shirt fitted at the wrist. At the end of your day out, check yourself (and your children) for ticks. Check both skin and hair, particularly warm moist areas such as the groin, backs of knees, armpits and neck. You may find it helpful to stand in front of the mirror while you inspect yourself as it can be easy to miss ticks due to their small size. Pay particular attention to the head, neck and scalp of children. If you find a tick, remove it as described below, and consult your GP if symptoms develop. Check your pets for ticks after outdoor activities too. Firstly don’t panic. Your risk of developing Lyme disease increases the longer the tick is attached to your skin. However, if the tick is removed within the first few hours after a bite, you are very unlikely to become infected. Remove the tick (ideally with tweezers) by gripping it close to the skin. Wash the area as soon as possible afterwards with soap and water. If any of the mouthparts of the tick are left behind, remove as much as possible with tweezers. Check the skin over the next few weeks for a rash. Initial redness and swelling the same day is normal and does not indicate infection. If a rash or other symptoms develop, see your GP and report being bitten by a tick. Your GP will make a diagnosis and prescribe treatment if necessary. How common is Lyme disease in Ireland? The true incidence of Lyme disease is not known in Ireland; recent estimates suggest that there are around 200 confirmed cases identified each year. Information on Lyme Disease is available from the HSE (https://www.hse.ie/eng/health/az/l/lyme-disease/) and click here to download a booklet with some useful information.